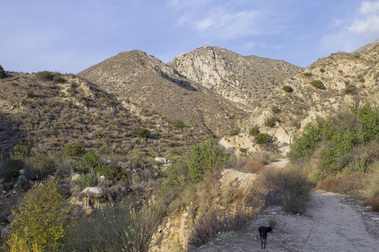 As a coastal community, the Los Angeles area boasts plenty of sand, sea and sunshine activities, and the surrounding mountains offer a myriad of hiking opportunities to commune with nature. Due to the arid environment, however, natural water features such as streams and waterfalls can be hard to come by. It’s not that they don’t exist, but it takes a little more effort to find these hidden gems. Some water courses flow year round, while others only dazzle during the brief rainy season in the winter and early spring months. 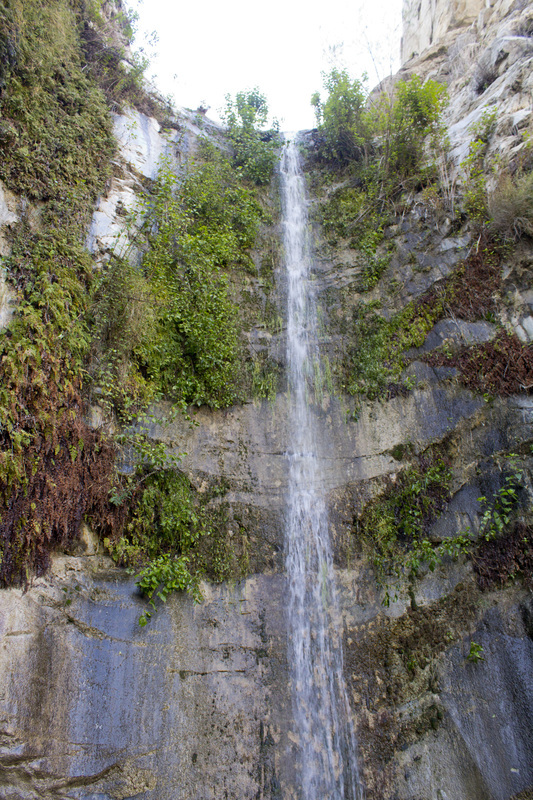 One such cascade is the Canyon Trail Waterfall located on the western edge of the San Gabriel Mountains near Tujunga, CA. 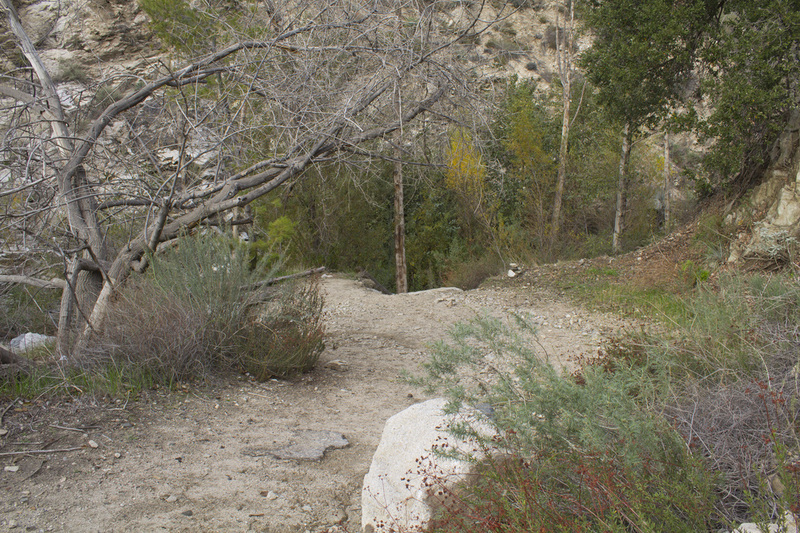 This 40’ beauty is located approximately 2 miles in on the Trail Canyon Trail. 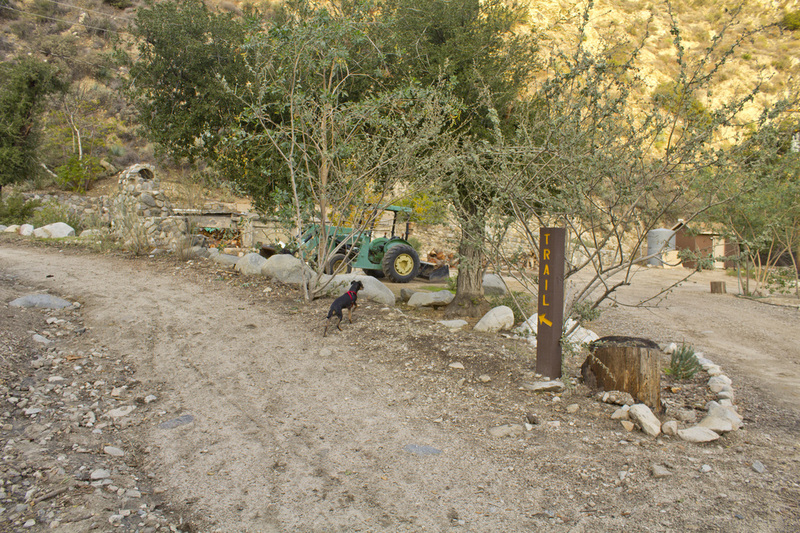 The trail starts in the dirt parking area near several private cabins and follows a fire road for about .75 mile before becoming a single-track trail. 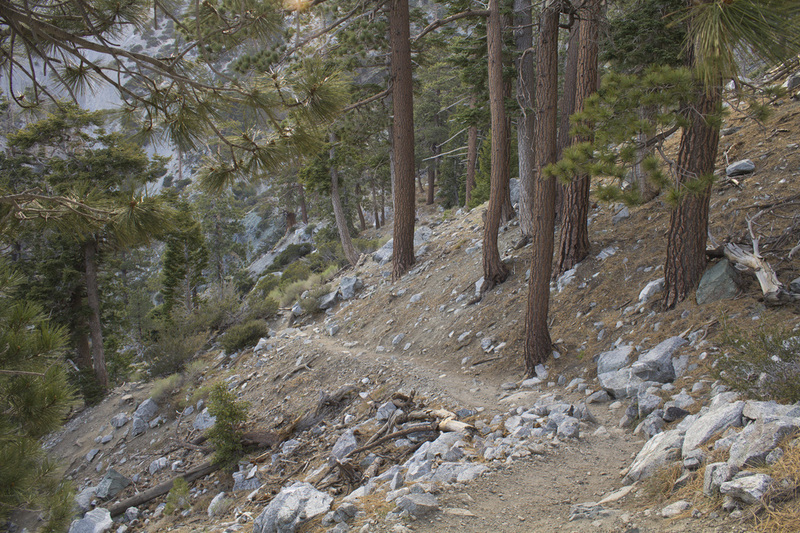 The single-track winds through the lower Trail Canyon, crossing Golden Creek a number of times. 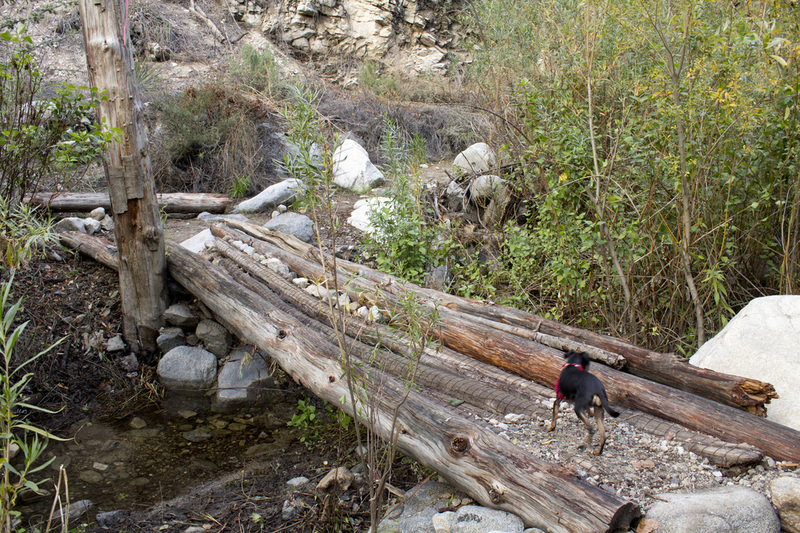 Wider sections of the creek are crossed on footbridges, while smaller sections are forded on foot. 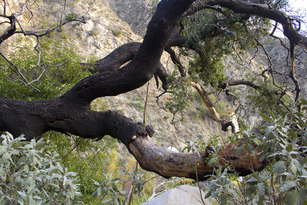 The riparian creek bed, populated with sycamore and oak, stands in stark contrast to the chaparral dotted walls of the canyon. 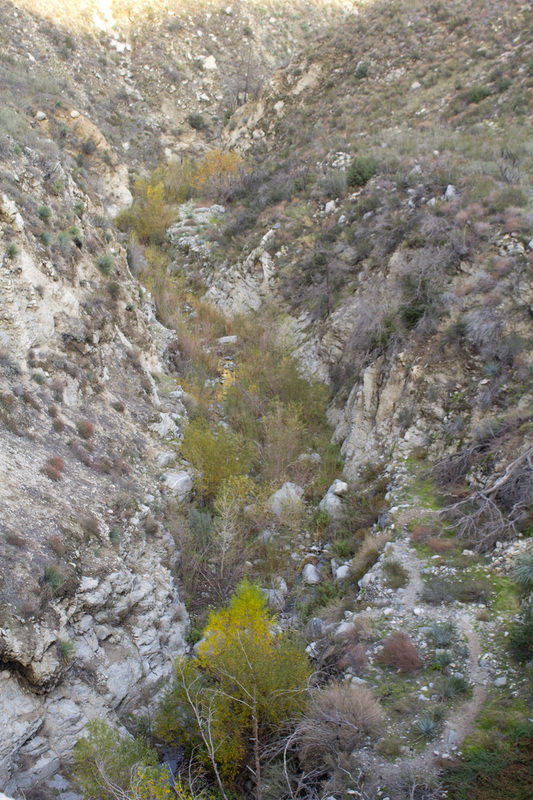 At just over a mile, the canyon opens up into a large wash. Much of this area was decimated by the Station Fire in 2009, and the trail can be hard to follow. Keep to the left and look for a cluster of oak trees at you 11 o’clock position, as the trail runs right past this cluster. 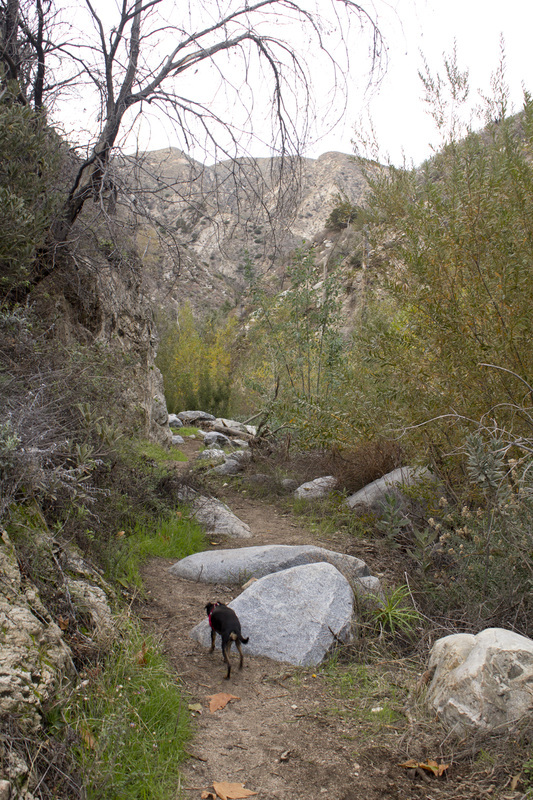 From here, the trail is well delineated and begins to climb the canyon walls away from the creek. Your first view of the falls will be in about .5 mile. In the fall, the deciduous trees along the creek below may be ablaze with color and is a beautiful sight in itself. 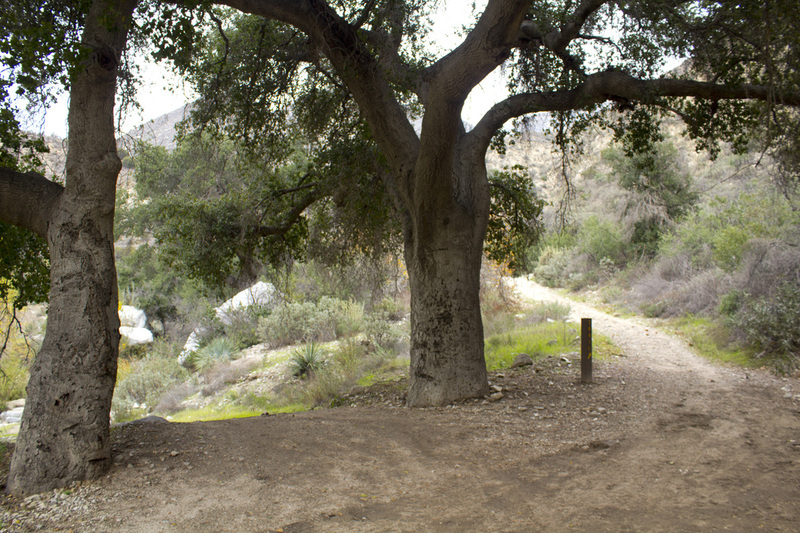 Just before you reach the falls, there is a short, but steep spur trail that leads to the bottom of the falls and a very small wading pool. The foliage at the bottom may be very thick and some boulder scrambling is required, but is worth the effort to gaze up at the moss covered, horseshoe shaped walls. Continuing on the main trail above, you will reach a great overlook of the falls for some fantastic picture opportunities. A short distance beyond the overlook affords the chance to cross the upper creek and visit the head of the falls. The Trail Canyon Falls can flow throughout the year, but summer months may see little more than a trickle. The best time is right after a rainfall when water flows will be heavier. 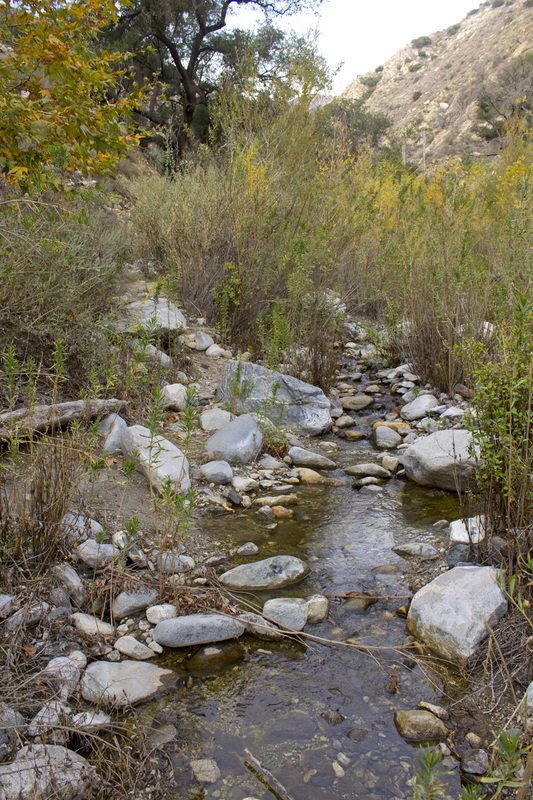 Late fall adds some vibrant color to the lower creek bed, whereas early winter months can be bare. Late winter and early spring brings a lush green to the canyon, dotted with colorful wildflowers. From the 210 Freeway, exit at Sunland Blvd. and head north. Just past the Ralph's Supermarket (approximately .4 mile), Sunland becomes Foothill Blvd. Continue straight on Foothill Blvd for another .4 mile to Oro Vista Ave. and turn left. Follow Oro Vista for .88 mile where it makes a sharp right turn and becomes Big Tujunga Canyon Road. 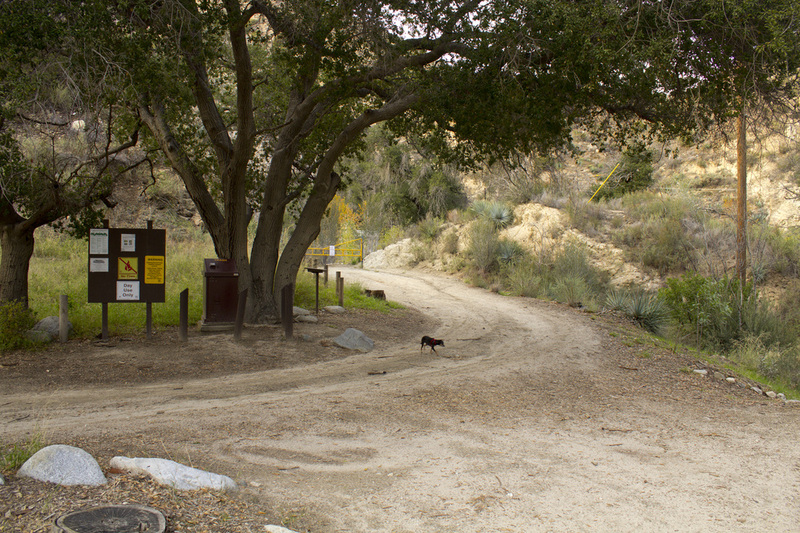 Continue on Big Tujunga for 4.4 miles and turn left onto North Trail Canyon Road/Forest Route 3N29. North Trail Canyon Road is a dirt road and not well marked, so watch for it. In .2 mile North Trail Canyon Road and the Forest Route diverge. Take the fork on the right and continue for about .5 mile to the parking area. 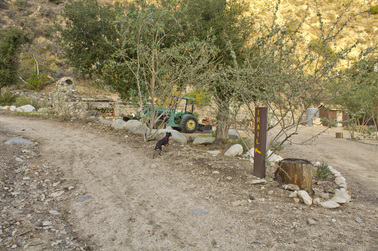 Park in the dirt lot opposite the trailhead signs. just under .1 miles ahead. 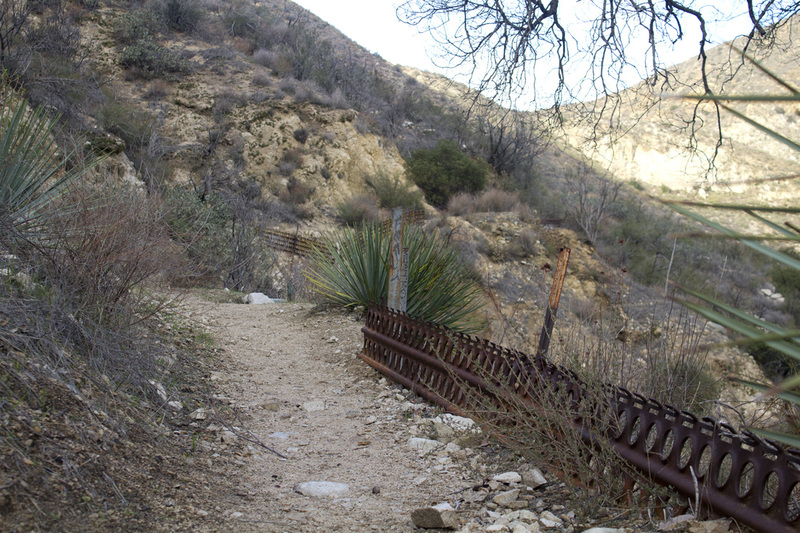 the upper perimeter of the Trail Canyon Wash.
mile to the next trail junction. Wash, fording the stream at several points. from several logs wrapped with metal fencing. pick up the trail again, it is well delineated. often mistaken for the Trail Canyon Falls. There is a waterfall located here that can pull you off the main trail. This fall is usually dry except immediately following a heavy rain. you are on the right trail. your first view as you round the corner. Congratulations! You've reached the top of Trail Canyon Falls.